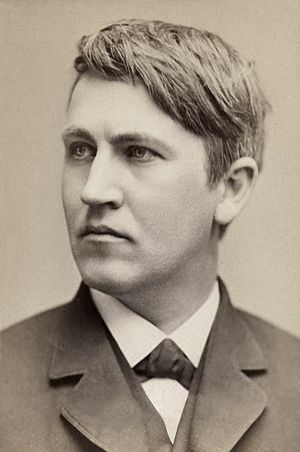 In 1882, the Edison Illumination Company opened two electric power plants – the famous coal-fired Pearl Street Station in downtown Manhattan and the river-powered Vulcan Street Station near Green Bay, Wis.
Thomas Edison faced two of the biggest problems utilities still face 130 years later: how to maximize utilization of expensive capital assets and – for his hydropower plant — how to maximize the use of the free fuel from the river. His primary end product was lighting, and you can’t store light. When you need it, you need it — not much flexibility on when. On top of that, his service territory had the geographic diversity of a single neighborhood, so the sun set on all of his customers at the same time. So, as you might expect, the daily usage profile — the load curve — was anything but flat. Virtually nobody was turning on expensive, short-lived light bulbs in the middle of the day or after they went to bed — in fact many early power stations chose to only operate in the evening. That was a huge financial problem. Investors were paying for expensive generators and underground wiring, but only selling their product for a couple of hours a day. In 1891, the industry came up with a new term for asset utilization: “load factor.” And it was low — less than 20%. At Pearl Street when they weren’t making electricity, at least they weren’t burning coal. At the Vulcan Street Station, however, the paddle wheel in the river idled more than 80% of the time. Unable to store that energy until it was needed, the free fuel just flowed unused down the river. Energy storage has been the Holy Grail of both asset utilization and renewable energy ever since the Edison era that began in 1882. Fast forward to the early 1900s: The economics for generating electricity were getting better. New markets had been developed, often deliberately to improve the load factor. These included electric streetcars for the morning and evening commute, factory equipment during the day, and pumps for the waterworks in the middle of the night. By 1910, executives were boasting of load factors greater than 40%. The load curve was starting to flatten out. Today, the load curve is flatter — load factors are closer to 55%. But 55% still means poor asset utilization, and that means opportunity. A couple of important things have changed since Edison energized his power plants. Today, less than 13% of the electricity used in U.S. homes goes to lighting — 45% now goes to “thermal loads” — heating, cooling, refrigeration, and electric hot water heaters. Thermal loads are different. Unlike lighting, where even a one-second interruption is both obvious and annoying, thermal loads have time flexibility. Air-conditioner compressors can be interrupted for tens of minutes without anyone noticing. A closed refrigerator can maintain food temperature for four hours without electricity. And electric hot water heaters can be interrupted for hours. You can store heat (and cold)! The other significant change is electricity metering technology. By the end of 2014, about half of all U.S. households will have smart meters. With the increased time-flexibility in our loads and this new ability to measure when electricity is consumed, incentives can be adjusted to coax the load to more closely match availability of supply. We now have the technology to put the energy storage in our homes and appliances to good use. Too much wind power in the middle of the night? Have your refrigerator make more ice. Not enough power on a hot summer afternoon? Use that extra ice to cool your milk and vegetables. The same can be true for all of your thermal loads. The Energy Storage Holy Grail has been found. It’s locked inside your refrigerator just waiting for your utility or retail electric provider to give you a pricing structure to make it worth your while to open it. This entry was posted in Electricity, Renewables and tagged Electric utility, Energy, Energy storage, Power station, Renewable Energy, Thermal loads. Bookmark the permalink.